My hat trick of ugly stops here people. This post is freakin redemption! Before we get to that, I need some help. It seems someone has either pinned or facebooked or something'd my sparkly purple snow mani. I have been seeing a humongous influx of hits to my blog and that post specifically. I am curious if anyone out there knows who and where. Just like to know how it got so popular all of a sudden. 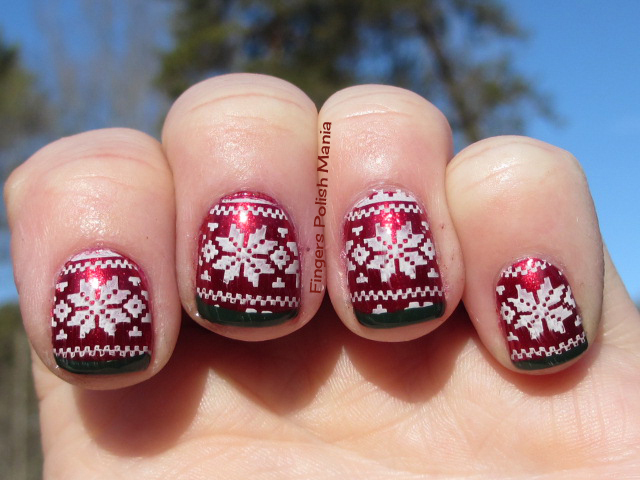 Also, I am so proud of this mani, that I actually entered it in a contest. Now those who have been paying attention know that I am not a joiner, or someone who does challenges and the like. I am one who likes to keep to themselves and go against the grain. Know what I mean? This contest doesn't start being judged until later this month. Trust that I WILL remind you to go vote for me! It was cool that some of you shared your freaky dreams with me. I love that you guys actually read my drivel and comment along. It keeps me going in my little blog world. OK, now on to the greatness. Here is the silly bottle shot. I could say I didn't want my bottle shot to upstage my fab mani for today, but who am I kidding? I'm just too lazy to think of new ideas! This is Bettina Ruby and American Apparel Hunter. I started with a full mani with Ruby. No accent nail today. Here are the starting shots. 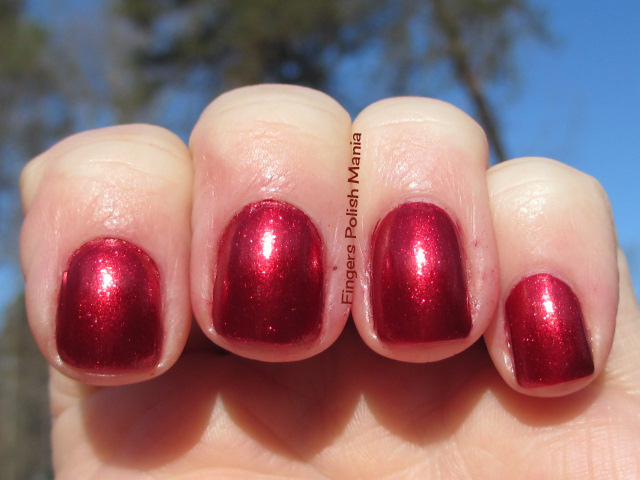 Isn't this just the most perfect shimmery red you've ever seen? Sort of Ruby Pumpish, but not quite as sparkly. I just love this color. Now I specifically ordered Nailz Craze plate NC03 just for this design I'm about to show you. I stamped with Sally Hansen Whirlwind White. Here is that step. 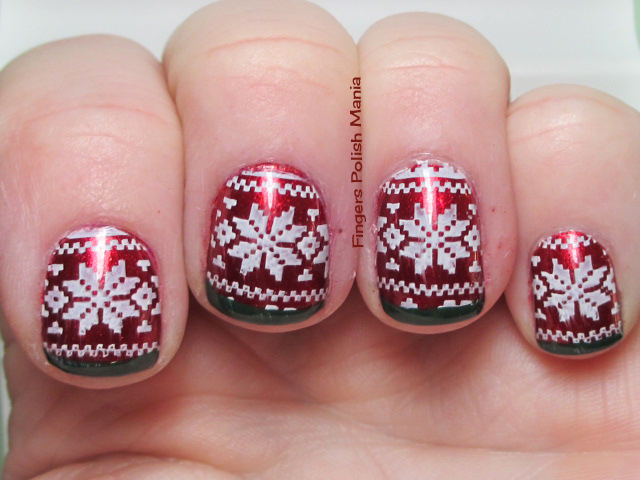 For those with larger nails, more of this gorgeous pattern will show. 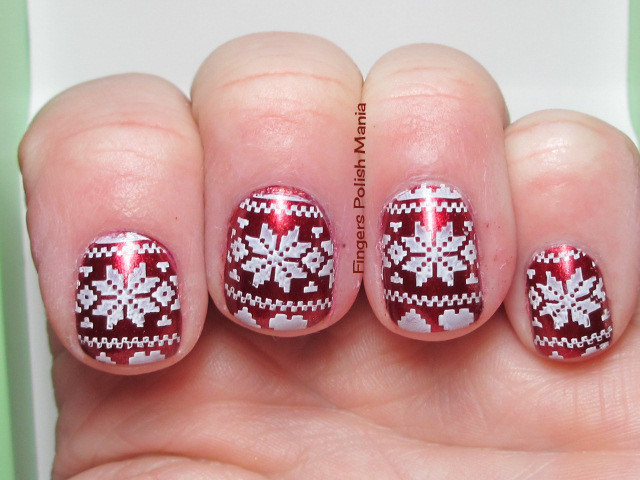 I am in love with this pattern!!! Plan on seeing it for the next few posts while I play with different colors and this design! Now I topped this off with my funky using Hunter. 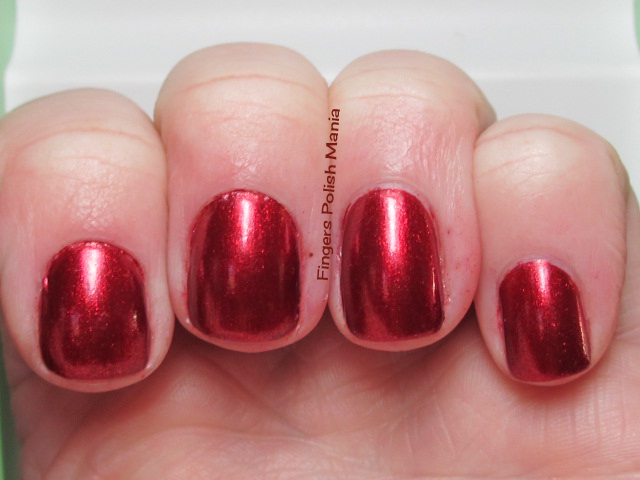 I thought about my holo topcoat, but was afraid of smearage and I thought Ruby had enough shimmer by itself. Here are the glorious results. How awesome is this????? I think this is one of my top five favorites of all time. I will be adding this to my header, once I figure out how to do it! Notice there is very little smearage, even though in real life, you can't see it. So I have entered this in a contest for the blog Nailz Craze. As I said before, the judging starts later this month. I will remind you at that time to go vote for me. Do you think this is a winner?